News & updates on our coins and anything else that captures our interest. Plank-Cut coins can fill a pocket or purse very rapidly due to a slightly larger size. The lacquer coating seals in the print to look and feel beautiful for years to come. The face-grain of the wood, on the face of the coin, presents a unique character on every coin. Plank-cut coins stay pristine through multiple uses and can be lightly washed. If you require a promotional coin to be utilized as a souvenir or a true branding tool over time, our Plank-cut coins are the only choice as they maintain clean, sharp, long lasting clarity. Broomstick coins are smaller than our Plank-cut coins. Having no lacquer coating the Broomstick coins tend to collect dirt and turn a dark grey over a short time. Broomstick coins are rapidly produced and much less expensive. If adorned with a Hot Foil print Broomstick can look brilliant, even in poor light. 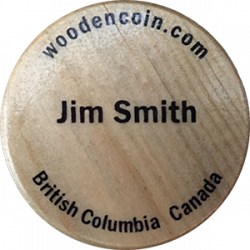 If you only require a wood coin for a weekend entry to an event, fair rides or for drink tokens at a dance, Broomstick coins are your ideal choice. We appreciate the local couple who had us print an invite to attend their ‘25th Anniversary Party’ on the back of each ‘Wedding Coin’, which were set at every place setting for the wedding supper, rather than the traditional book of matches. We are proud that if tucked away today our wooden coins will look as good for the 2037, ‘25th Anniversary Party’ as they did during the 2012 Wedding. ‘Plank-cut’ style wooden coins refers to our method of producing wood coins from solid boards 3/16” and 2” wide. This allows the beautiful, unique face-grain of each board to be displayed on the faces of our coins. The more porous and dull end-grain is religated to the edge of our ‘Plank-cut’ wooden coins, where it should be. This process also lends strength and longevity to each coin. The method of producing ‘Broomstick’ coins first calls to produce a long wooden dowel in the diameter of the desired coins, (a broomstick). Thin discs are sliced from said broomstick which then situates the far less desirable end-grain of the dowel, to the faces of the coin. The natural appeal of the wood face-grain is then found on the thin edge of ‘Broomstick’ coins. These coins tend to be brittle and crumble in time.